Crowds dwindle, permit competition eases, and if the upper mountain freezes climbing gets much easier. There’s nothing quite like climbing a living mountain. Now’s your chance. Fall brings some of the very best days of the year to summit Mount St. Helens, the most active volcano in the Cascades. Its heart beats with earthy rumbles. Its steamy breath vents skyward from a lava dome that is taller than the Space Needle. 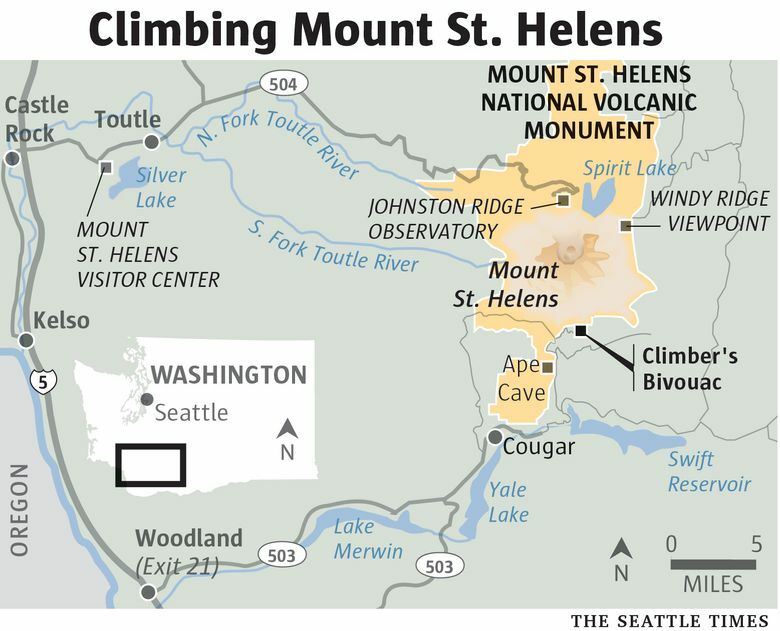 St. Helens even speaks, with the sound of rocks and landslides tumbling down its steep crater walls. To experience this force of nature, you’ll need a permit, which can be difficult to obtain during the busy summer climbing season. In fall, demand for permits — administered through the nonprofit Mount St. Helens Institute — is much lower, though permits for 2017 weekends are already sold out until late October. As of this writing, hundreds of permits remain for October weekday climbs. “There are some very nice days in October and it’s much less busy,” said Andy Goodwin, a volunteer mountain steward for Mount St. Helens Institute, who has climbed the mountain every month of the year. Once you’re standing atop the crater rim at 8,363 feet, prepare for an astonishing sight. You’ll see the remnants of a mountain that blew up in 1980, then built a new lava dome with eruptions from 2004 to 2008, and continues to rumble with earthquakes. “To give you an idea how big it is, most of what we know as downtown Portland would fit inside the crater,” said Peter Frenzen, Mount St. Helens National Volcanic Monument scientist. For Kristen Currie, of Seattle, and her sister, Kelley Reed, visiting from Tulsa, Oklahoma, the volcano was suitably impressive during their climb in late August. Steam vented from the lava dome as they sat on the crater rim, eating lunch. While they took in the view, a helicopter landed inside the crater, looking tiny beside the mountain’s massive rock features. 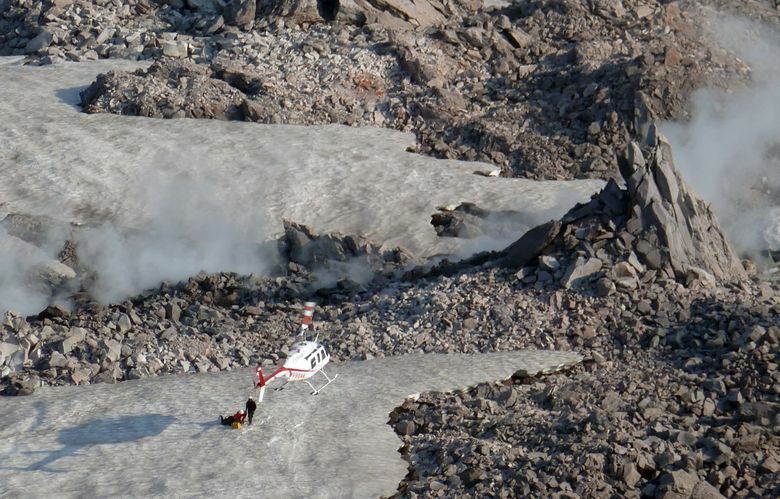 Geologists hopped out to take measurements as the helicopter took off. Climbers aren’t allowed in the crater, but researchers regularly visit the lava dome, which is settling now from its peak height in 2008, Frenzen said. The best place to watch the activity is from the rim, he added. Besides its settling lava dome, Mount St. Helens has “a large active glacier in the crater that’s moving north,” Frenzen said, another change to this ever-changing environment. 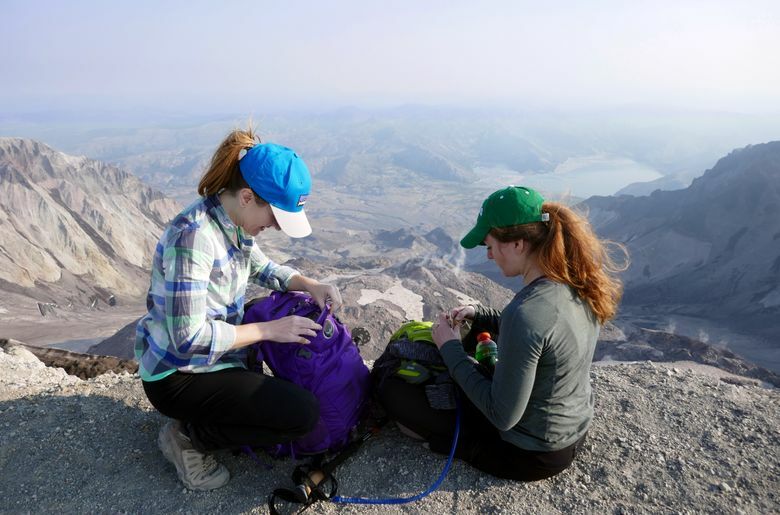 While climbing Mount St. Helens is nontechnical, it is by no means easy. 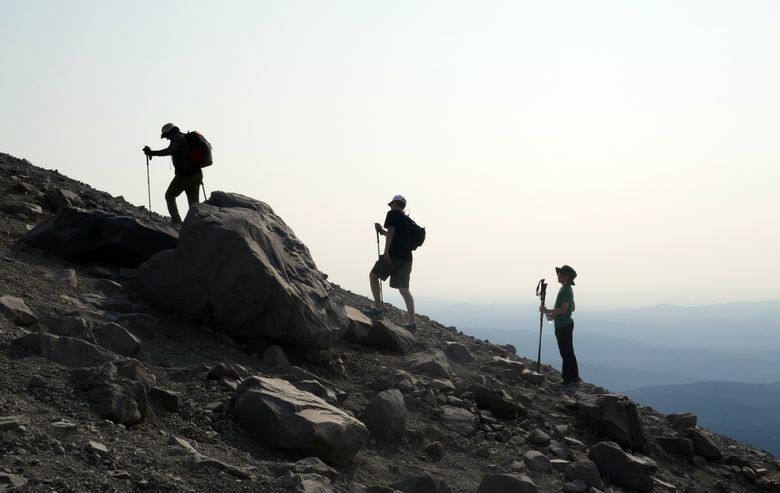 The 5-mile journey to the rim from the Climbers Bivouac Trailhead in Gifford Pinchot National Forest on the mountain’s south side gains 4,500 feet, much of it done on challenging boulder fields. After a 2.25-mile hike through a forest on the Ptarmigan Trail that gains a modest 1,100 feet, the final 3 miles above tree line follow Monitor Ridge on a grinding, difficult ascent that doesn’t always follow a distinct trail. Many injuries occur on the boulder fields, Yurkewycz said, where sharp volcanic rocks scrape skin and twist ankles. The most common climbing issue is dehydration. Most of the summer and fall, no streams are running, so each climber should carry at least 3 quarts of water, Yurkewycz said. Still, climbers forget to bring enough water or don’t think they’ll need it, only to become parched when they reach the top. Because it is strenuous and some climbers are unprepared, Yurkewycz estimates that between 20 percent and 40 percent of those who start out never reach the top. A big factor in their success is weather, Goodwin said. It’s important to know what you’ll be facing — temperature, wind, visibility — before heading out. “A lot of folks don’t understand the effects of altitude on weather,” Goodwin said. It can be a beautiful, sunny day in Portland, and be snowing on the Mount St. Helens summit. Before heading out, get an accurate weather forecast and carry extra clothing even if you don’t think you’ll need it, Goodwin advised. It takes most climbers between six and nine hours to complete the round trip to and from the crater rim. 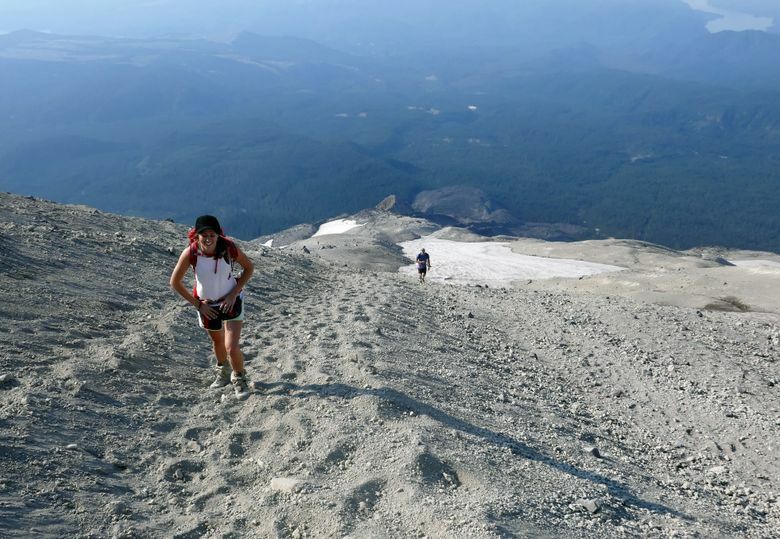 In many ways, climbing the mountain in fall is easier than summer, Goodwin said. Starting in September, wetter weather, occasional snow and ice help solidify the top 1,300 vertical feet of the mountain, making it easier to climb. In summer, this area is known as “the vertical beach” with loose rock, pumice and ash that make the going extremely slow. It’s two steps up, one step back. Once it freezes, the squishy quality is gone, providing firmer footing. If you choose to climb in fall, Goodwin advises looking carefully at the weather before heading out. If conditions are icy on top, crampons or traction spikes are a good choice for safe footing. Even if he faces an iffy forecast, Goodwin always enjoys the adventure of exploring this very special place. From May 15-Oct. 31, permits are limited to 100 per day and cost $22. Buy one for each climber at the Mount St. Helens Institute website, mshinstitute.org. If permits are sold out on the date you want to go, don’t despair. A popular resale website, Purmit.com, is used by many climbers. Trips after Nov. 1 are free, though climbers must self-register at the trailhead. Travel time is about four hours in normal traffic. From Seattle, drive south on Interstate 5 to Exit 22 in Woodland, Cowlitz County. Follow Highway 503 to Cougar. From Cougar, take Lewis River Road east (Forest Road 90) for 6.4 miles and go left on Forest Road 83 for about three miles. Then stay left on Forest Road 81 for about a mile, turning right onto the gravel Forest Spur Road 830. Follow until you reach the large Climbers Bivouac Trailhead parking lot. A Northwest Forest Pass is required. The 10 Essentials, as always. For St. Helens, that should include plenty of extra clothing, 3 quarts of water per person, extra food, a first-aid kit and a headlamp with fresh batteries. Several tent spaces are available at the trailhead; dispersed camping is allowed in many locations in Gifford Pinchot National Forest. Track the weather forecast at Mountain-Forecast.com, Northwest Avalanche Center and National Weather Service.